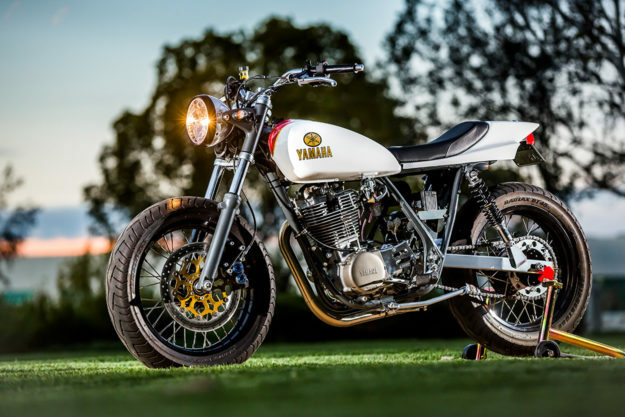 Despite the state of the SR500, Richard really liked its basic theme—just not the execution. “All the right intentions … but the puzzle was just assembled all wrong,” he tells us. Richard decided to redo it, do it right. He stripped it down to the frame, repairing cracks, filling holes, and straightening or removing brackets until everything was perfect. Then he added a new rear loop and seat brackets. Mule’s set up the steering head to take the forks and triples from a 2006 Triumph Bonneville. 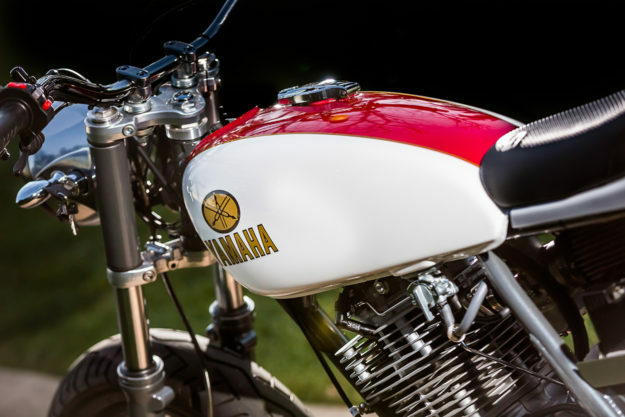 That meant he could also install the Bonnie’s headlight brackets—pairing them with an LSL headlight for a ‘factory’ look. The forks themselves were sent off to Racetech for a rebuild and set of emulators. 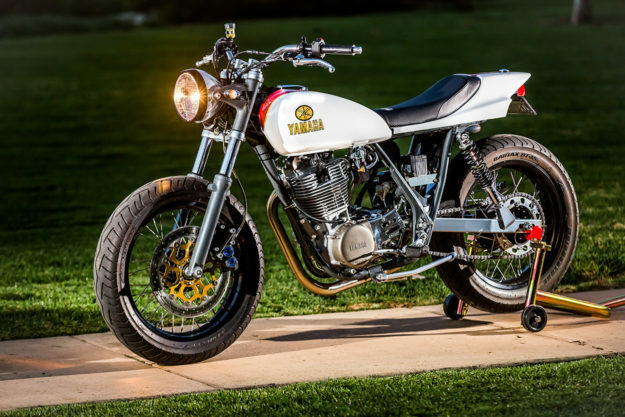 Custom lower shock mounts were fabricated, allowing him to keep the shorter, adjustable Koni shocks—but allowing the Yamaha to sit a bit higher than stock in the rear. The frame was then detabbed and powder coated a dark metallic grey, while the swingarm and triple clamps were shot with bright silver and a clear coat. 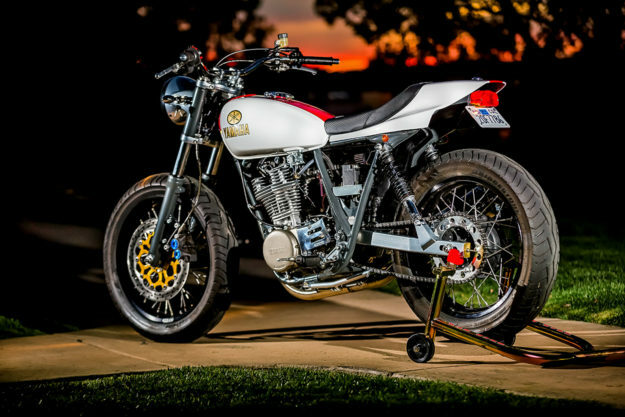 Richard also swapped the stock side stand and mount out for a Mule kit—complete with a lightweight chromoly stand. For the wheels, Richard used an 1975 XS650 front hub, but needed to move the bearings outboard to work with the wider forks. So he turned down the sides to accept custom bearing carriers. The rear already had a XT500 cush-drive hub—but it was trashed. So on went a lighter TT500 hub in perfect condition. 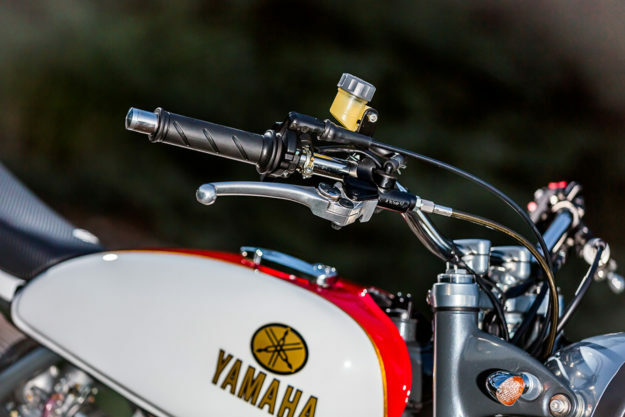 Braking upgrades include a custom front line from Crown Performance, hooked up to a Thruxton master cylinder and a 4-piston caliper from a R6, mounted on a custom bracket. The front disc is new too: it’s a floating Brembo unit from a Ducati, which turned out to be a perfect match for the XS650 hub’s bolt pattern. 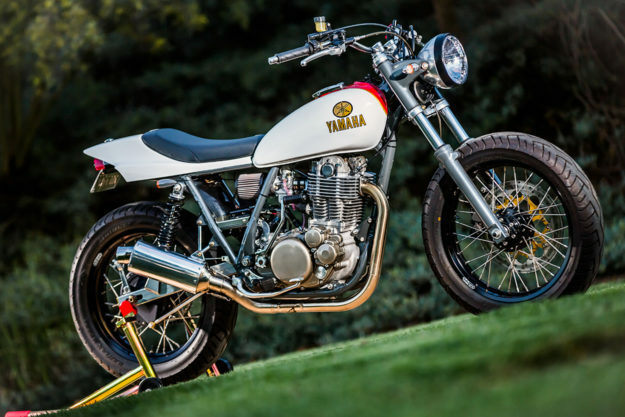 Moving to the cockpit, Richard fitted a set of Mule stainless steel flat track bars, and a set of XS650 risers. The throttle is a quarter-turn number, sourced from a Ducati Hypermotard, and the levers are both Thruxton parts. Switchgear from Baja Designs wraps things up. As for the bodywork, the fuel tank is stock, but the seat unit is from First Klass Glass. 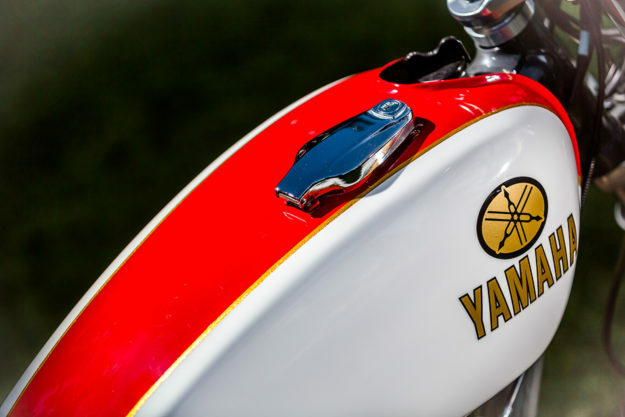 (“The highest quality fiberglass parts I’ve ever seen, and infinitely lighter than the one it replaced,” says Richard). 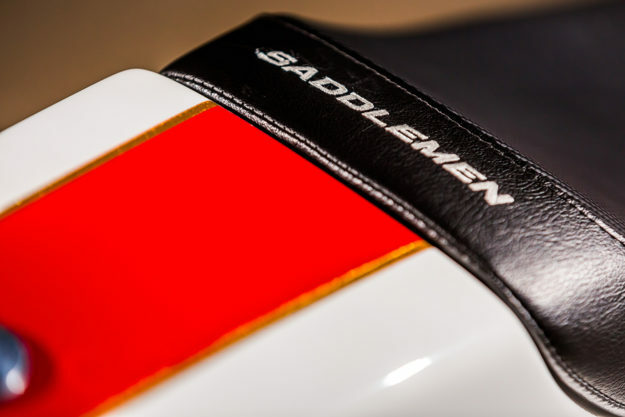 The tail was sent to Saddlemen to be finished off with a custom seat pad. The motor already had a Carillo rod and a Megacycle cam installed, both of which were in good nick, so those stayed. A new, stock ignition system went in though, along with a new 36mm round-slide Mikuni carb. With the motor sorted, all that was left was to rewire the bike—complete with OEM coloring on the wires. A new battery tray holds the basics, along with a lightweight Lithium-ion battery from Shorai. 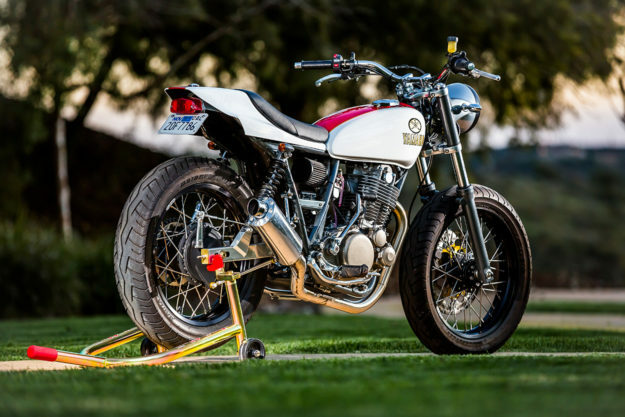 Notwithstanding the fact that it’s gorgeous, this is one of the most thoroughly reworked SR500s we’ve seen (if we listed every detail, it would fill a book). Richard tells us it’s going to be hard to part with it—and we believe him. Who else wishes they were taking it home? 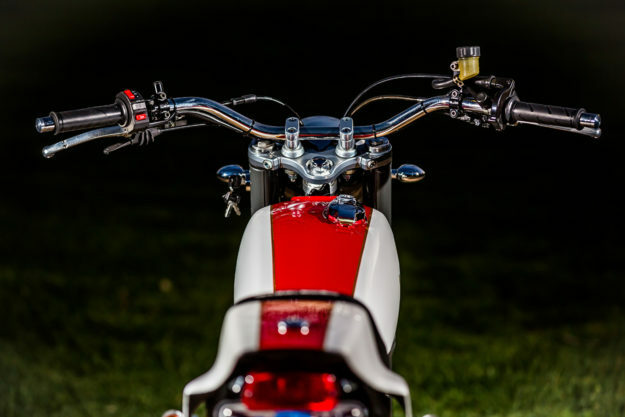 Mule Motorcycles | Richard Pollock Instagram | Images by Olivier de Vaulx.